Is this a stress fracture? 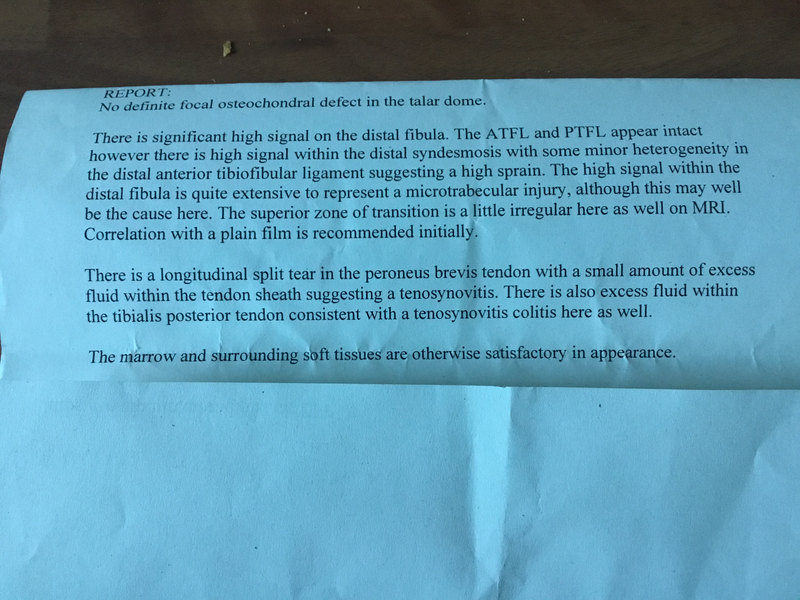 Trying to interpret mri report, included. I've been referred to an ankle specialist following an mri but nothing has been explained to me. I've had significant pain for over 6 months now. Took 6 weeks off exercise in the summer and it didn't really help. I can see I've got a tear in one tendon, an issue with the other tendon and a sprain in a ligament. It's the high signal thing on my fibula which I'm not sure about. Google suggests a fracture, so I'm guessing a stress fracture? I haven't had any advice about whether or not I can continue exercising and am currently still running but only 5k once a week. Then lots of cycling and body pump classes on top of this. Not sure how long it will be until I see the ankle consultant. I would think that with a torn tendon, another damaged tendon and a sprained ligament, whether it's a stress fracture or not, the advice would be to rest and allow it to heal. Running, cycling and pump all put stress on the ankles, so you are not doing the poor thing any favours. I'm surprised that you had no advice though - is there anyone you can phone (were you referred by your GP?) for advice? Thanks. I paid to see a private physio today who has told me to wear a walking boot. I can carry on cycling but no running or pump. He thinks I have a stress fracture from the mri report.